Transfer tables to and from MS SQL Server and Paradox databases. 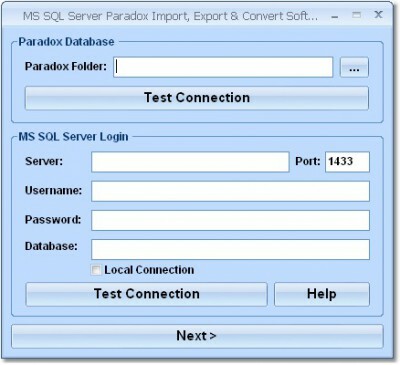 This software offers a solution for users who need to transfer tables between MS SQL Server and Paradox databases. Simply open both connections and the user friendly interface makes copying fields easy. This program is designed for Paradox 5 databases. Higher versions of Paradox databases can be saved as 5 and used with this program. This software will save you time because importing and exporting can be done without SQL knowledge. Transfer tables to and from MySQL and Paradox databases. Transfer tables to and from PostgreSQL and Paradox databases.